Child safety takes a new turn with the new Maxi-Cosi AxissFix Plus. This car seat combines state-of-the-art safety performance, by complying with the latest i-Size car seat legislation, with 360° swivelling seat making securing your toddler a breeze as the seat faces outwards. 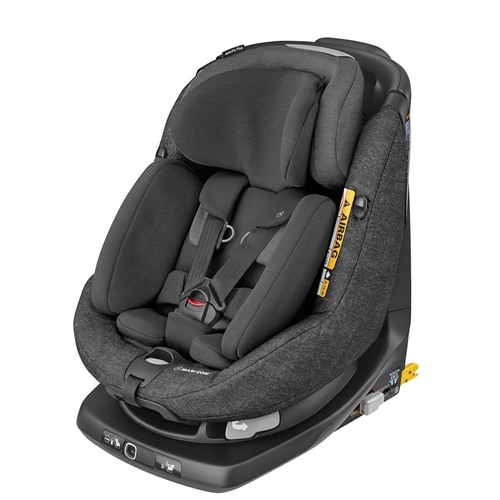 Thanks to AxissFix Plus parents don’t need to lean over and squeeze in between the car seat and the back of the front seat. It allows front-on access by just turning the seat towards the parent. Within seconds you can buckle up your child and rotate the seat in the correct travel position. The i-Size regulation does not replace the current ECE R44/04 regulation, so you do not need to upgrade your existing child car seat. If you currently use a rearward facing child car seat that is fixed to the car by the seat belt, you can continue to use it. The introduction of i-Size simply means that you now have an extra option when buying a car seat for your baby/toddler – an option that complies to the new i-Size safety regulation. Child car seats that comply with the new i-Size regulation provide up to twice as much protection as conventional child car seats. For example, i-Size seats provide better head and neck protection, thanks to longer rearward facing travel up to 15 months. i-Size also provides better side-impact protection because, for the first time ever in a child car seat regulation, it includes a set of minimum performance criteria for this type of collision. i-Size seats are also much less likely to be installed incorrectly, because they have a simple click-and-go installation system that does not involve the car’s seat belt. In addition, the i-Size regulation will help prevent moving your child to the next stage car seat too early – specifically, from a rearward facing seat to a larger forward facing one. That’s because it has a clear specified requirement of 15 months old and/or 75/80 cm in length, instead of 9 to 12 months. The chance of moving your child to the next stage car seat too soon is also minimised because the child’s length is used in the deciding factor and parents will not mistakenly conclude that their child has outgrown the first seat his feet are outside the seat. And finally, i-Size means more peace of mind. Not all current child car seats fit all car models securely. However, all i-Size car seats do fit most cars equipped with the ISOFIX system and all cars with i-Size seating positions.